The door is tucked back under a deep front porch so that you only catch a glimpse of it from the street. I don't have a great shot from that angle, but I'll take one next week and post it for you. That beautiful green door says "Welcome"! Like you, I prefer it w/the white but can certainly understand drawing the color from the outside of the house to tie it all together. The widows up high are great for privacy and letting in enough light. Will definitely go that way when replacing our front door! I never would have thought about painting the door lime green, but I love it with the blue of the house. It looks classic yet still very modern and stylish! Wow! I love the lime green with the blue of the house. It looks classic yet still very modern and stylish. Oh my god I LOVE that lime green door!!! Punchy colored doors are just divine. We painted ours yellow and it makes me smile every time I come home. Nice pics! You really know your stuff. Thanks for commenting on my coffee shop question. The shine of the green with citrus and flower stem glow and the stability of the gray with the contrast of the possibilities of the white makes me think of happy children splashing around in galoshes in a late Spring rain, laughing as if to say the gray clouds, "Gotcha"! 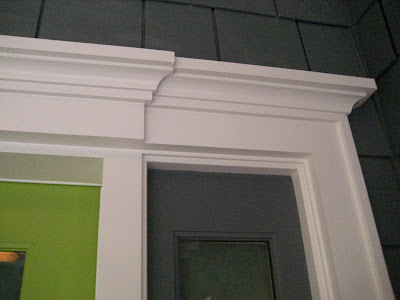 Love the moldings! Nice to see craftsmanship still alive and well! Any chance you could list the brand and color of the green paint? 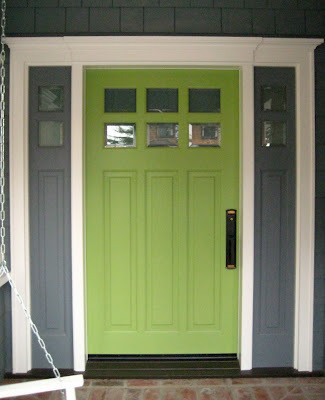 It would never have occured to me to paint a front door lime green, but it is perfect! I could not love it more! The color is Benjami Moore 538 Vienna Green. Good luck with your project! Hi, I love the colors you've chosen. Could you please share the supplier for the Boothbay (is it Benjamin Moore's Boothbay Gray)? Thanks! Hi, the blue of the HandieShingles and HardiePlank Siding comes pre-colored from the James Hardie company, it's their Boothbay Blue. All other trim was color matched to the shingles, so I'm afraid I don't have a formula number. You could order a shingle sample and take it to your paint store though. Good luck!